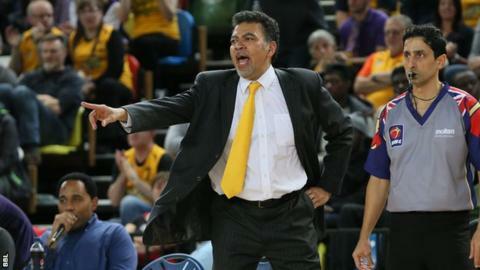 London Lions reached the semi-finals of the British Basketball League Trophy after victory over Sheffield Sharks. Lovell Cook led the way with 22 points, while Makal Stibbins contributed 19 in the 86-80 win that set up a semi-final against Leicester Riders. "Being one tie away from reaching the BBL Trophy Final is exciting for us. "The next task for the club is to show we can reach Finals and win some silverware," said London head coach Vince Macauley. Newcastle Eagles and Plymouth Raiders complete the final four. Meanwhile, Newcastle moved four points clear at the top of the Championship by following up their North-East derby win against Durham Wildcats with a 95-89 victory over the Riders on Saturday. Leicester recovered to beat Surrey United on Sunday, but they now trail the Eagles by eight points in the table. Worcester Wolves kept up the pressure at the top by consigning the Wildcats to their second loss of the weekend, by a 66-58 margin, and Cheshire Phoenix maintained their slim Championship hopes as they beat Plymouth 116-107 in a high-scoring game. The Raiders triumphed over Glasgow Rocks on Friday, but the Scottish side rebounded with a seven-point away win at Manchester Giants. Bristol Flyers ended a four-game losing streak in a 70-62 victory over Surrey on Friday, which moved them to within two points of the Giants and the final play-off spot. Nottingham Wildcats suffered their first defeat of the season in WBBL at the hands of Team Northumbria, who took a 78-73 victory behind a combined 44 points from Fiona O'Dwyer and Teresa Manigrasso.